To God be the glory for all that He has done. I'm Robert Allen and my wife is Adriene Allen. We have dedicated our lives and this site to the work of the Lord. We are yielding ourselves to the leading of the Lord as we travel from coast to coast, in search of lost souls that need to hear the Good News of our risen savior Jesus Christ. It is our desire that you be a part of our travels. First and foremost that you would lift us up in prayer, believing that God would continue to lead us and guide us as we surrender ourselves to His will for our lives. We also would like for you to come along for the "ride" and experience the journey with us. The good times, and the not so good times; the great experiences and the not so great experiences. God never promised us that every day would be wonderful in our sight, but He did promise us that "If we would acknowledge Him", He would direct our paths, and that makes for a great day. 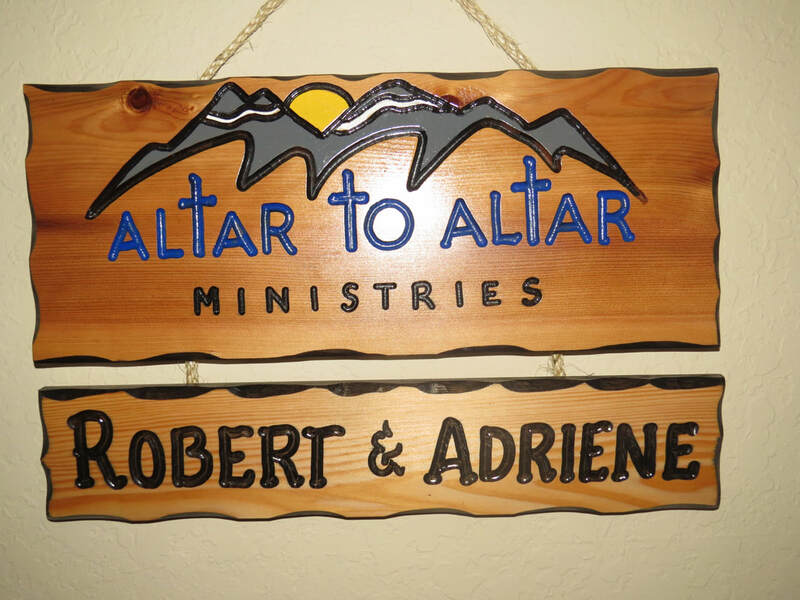 Thank you for joining us at Altar to Altar Ministries, I’m Robert Allen, and I’m joined in ministry with my wife Adriene. Together, we have served in many aspects of ministry throughout our married lives and Altar to Altar is the culmination of those many years of service. I was born in Washington, D.C. and raised to adulthood in Landover, Maryland. I was blessed to be raised in the loving household with parents that loved the Lord, and loved me; along with an older sister and younger brother, that “liked” me sometimes :-) It was during my childhood, that I got the “travel bug”, as we would travel and “camp out” in campgrounds up and down the east coast during the summer months for many years. Following high school, I had the privilege of serving in military service for 26 years before retirement in 2006. I began my military career in January of 1981, serving as a Carpentry and Masonry Specialist in the U.S. Army. After completing Basic Training and Advanced Individual Training (AIT) at Fort Leonard Wood, Missouri, I went to my first active duty station at Fort Benning, Georgia in a Construction Engineering Company. It was there that I got my “first taste” as a military leader. After a few years at that assignment, I was stationed overseas on a “Hardship Tour” for one year in a remote town in Turkey. My leadership and communication skills were certainly tested there as I supervised a group of Turkish Nationals, who’s English was just a little better than my Turkish :). It was a great experience, but when my year was complete, I was ready to head back down south. I accepted another tour of duty back in Georgia at Fort Benning. It was during this assignment that I recognized more than ever, how blessed I was being raised in a Christian household, and through life challenges, I was continually reminded of the presence of God in my life. That assignment then led to my life changing assignment to Fort Wainwright, Alaska. When I received notification of that assignment, I had to actually pull out an atlas to find out “where exactly is Alaska”. Yes, I went from “balmy” Columbus, Georgia, to “brutally cold” Fairbanks, Alaska. It was in Alaska, that I met Jesus Christ, and accepted Him as my personal Savior (my life was no longer the same). Alaska is also where I met my wife, Adriene. We worshiped in the same church, and she “tracked me down” (my version). Alaska is where I spent most of my military career; it was also where God empowered me for service, transitioned me from the U.S. Army to the Air National Guard, afforded me many opportunities to serve in ministry, joined me in holy matrimony with my wife, and added 3 daughters to our union. ​Yes, we have a rich history, both physically and spiritually in the “Last Frontier”. I arrived in Alaska in 1987, and stayed there until 2004, when I accepted an assignment to Randolph Air Force Base in San Antonio, Texas. This assignment was not only a military assignment, it was also a God ordained assignment to continue to serve in His Kingdom. This was also my final military assignment where I ultimately made the decision to retire after 26 years of service. This is the condensed version of my military and spiritual journey; prayerfully, we will be able to meet up some time around a campfire in fellowship, and fill in some of the blanks. Until then, let’s meet here at our virtual “church without walls”. Great God - Great Praise! I'm Adriene, copilot of Altar to Altar Ministries. In this ministry, I unleash my passion for God's children by sharing and showing them the way to Jesus Christ. I was born in Portsmouth, Virginia. I had the opportunity, growing up, to travel overseas as a "Navy Brat". I graduated from high school on an island known as "The Birth Place of the Winds", Adak, Alaska. My Alaskan experience continued as I attended the University of Alaska, Fairbanks, graduating with a BA in Physical Education with a Teachers Certification. I remained in "The Last Frontier" for the next 23 years. A great deal of events had transpired in that amount of time! I was a physical educator and coach in a public school. I've been very active in the church since the age of 17; from teaching Sunday School to organizing and directing the Children's Church Ministry. I was also the Children's Choir Director, as well as an altar worker, where I prayed for many and saw miracles, signs and wonders! I was blessed to meet a wonderful man of God who is now my husband; Robert. His best friend told me that Robert had an eye on me from afar, so I just made it easy for him when it came time for him to propose ( that's my story and I'm sticking to it!) We ended up having three daughters who I call my three "Little Eskimos". I was very protective of their education, so I decided to homeschool them. I currently love the "little brother" state to Alaska, called Texas. I do miss the snow but I don't miss shoveling it and the -20° weather when I had to do playground duty! Here in Texas, I had the great fortune of coaching again at the high school level as well as working with students who required support from content mastery. I am now a retired teacher who has spent the past 10 years working in the children's ministry as a Director, Children's Choir Director, as well as a prayer warrior for the Altar Ministry at my home church in San Antonio. If I end up in your neck of the woods, or on your playground; join me with your kids as I pour into them the truth of God's love from the Word and show them how to give Him the highest praise!